Rap is beautiful, fluid, and powerful. It can move grown men to tears and transform suburbanites into hardened drug dealers for a few minutes at a time. Rap is poetry on HGH. And, when done properly, a rapper&apos;s silver tongue can rival any Shakespearean (or Petrarchan) sonnet. Plus, they have autotune, which puts Willy Shakes at a disadvantage. Occasionally, it is the opposite. Whether it&apos;s a semantics issue that distorts the meaning, an accidental factual inaccuracy or just flat-out inanity, rap has its fair share of blunders. 2013 is no exception. We&apos;ve reached the half-way mark, and there are plenty of mishaps from which to choose. We have compiled a list, as we have been known to do, to show that rappers are not infallible demi-gods but real people who are susceptible to mistakes and, in some cases, not good at their job. 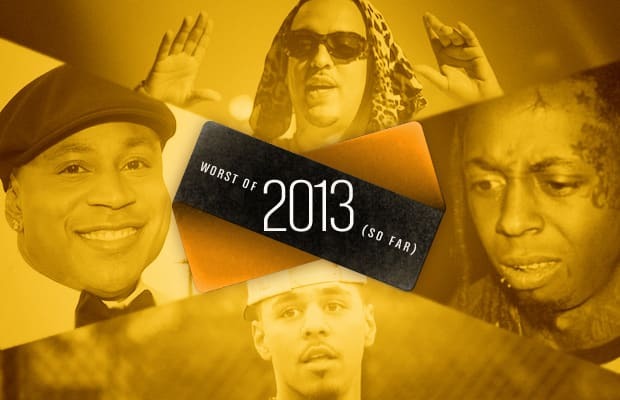 These are The 13 Worst Rap Lyrics of 2013 (So Far).